Limited edition of the Chiron 1 celebrating the 110th anniversary of the brand. 2 Fuel consumption, l/100km: not subject to Directive 1999/94/EC, as general operating permit not yet issued. The rear end is dominated by the diffuser and bumper in glossy Steel Blue Carbon with the contrasting matt black exhaust system. The underside of the rear spoiler boasts the French flag over its entire width. The rear spoiler mechanism is anodized in matt black to harmonize with the matt black Ettore Bugatti logo on the centre of the rear, the matt black wheels and the matching sports exhaust system. The Sky View roof consisting of two fixed glass panels above the driver’s and passenger’s seats, available as an option on the Chiron, is a standard feature of the special edition. These panels have a newly developed laminated structure with thin glass and four intermediate layers. 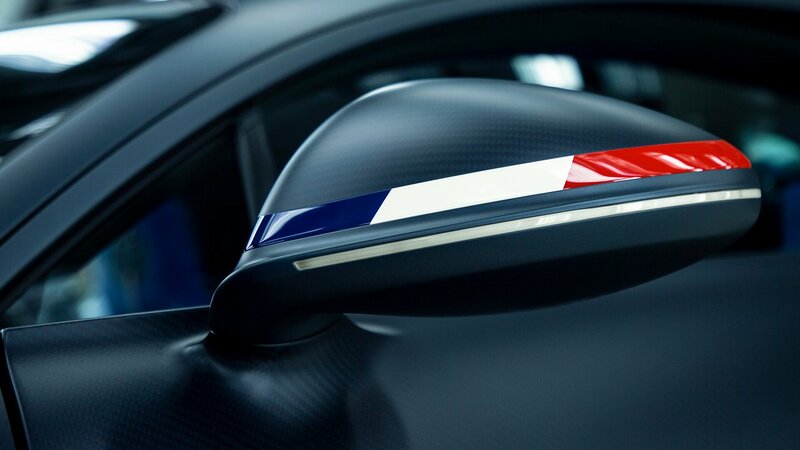 The French tricolour also features at several points in the interior of the “110 ans Bugatti” special edition. These include the two headrests and the back rests of the sports seats, decorated by high-quality embroidery with the French flag in a vertical position. The body and the front end are made from carbon fibre and the Bugatti line and the typical Bugatti radiator from aluminium. The body and the front end are made from carbon fibre and the Bugatti line and the typical Bugatti radiator from aluminium. The matt Steel Blue paintwork at the rear of the car, produced in a complex process, has a sheen like hot-rolled steel. To obtain an immaculate finish, the aluminium filler cap is sandblasted and hand-polished. The “110 ans Bugatti” emblem, with the French flag running vertically through the logo, features at the centre of the cap. The underside of the rear spoiler boasts the French flag over its entire width, the rear spoiler mechanism is anodized in matt black.